This is a good shot of the same type of helicopter that was used on the rescue mission, the RH-53D. Notice the extra fuel tanks on the landing gear pylons. That is why this aircraft was preferable to the normal CH-53, it's long range! Right away, when the rescue attempt was planned, arrangements were made to have 8 of these aircraft sent to the Indian Ocean, to be loaded on board the Nimitz. They had to send them in a round-about way. These are the men of HM-16. Mine Countermeasures Unit Bravo (MCMUB) was commissioned on 20 September 1974 as a command and control functionary responsible for planning, co-ordinating and executing mine countermeasures operation orders and maintaining the unique Airborne Mine Countermeasures (AMCM) equipment used by the helicopter mine countermeasures squadron. The unit also establishes and maintains the precise navigation systems and provides computer generated clearance plans vital to efficient mine countermeasures operations. Originally homeported in Charleston, South Carolina, the Command moved to Norfolk, Virginia in the spring of 1976. Charleston, South Carolina; Norfolk, Virginia; La Spezia, Italy; Toulon, France; and Rota, Spain. (HM-16) with a quick response world-wide deployment capability. weight of 42,000 pounds and is capable of speeds up 160 knots. In spite of it's huge size, the RH-53D Sea Stallion has been known to make a few loops from time to time. the final step in a "sweeping change". demonstrate their capabilities in AMCM operations in preparation for the squadron's first deployment. USS Shreveport (LPD-12), participating in Exercise Solid Shield '79. Operations included both mechanical and influence airborne mine sweeping from the flight deck and well decks of the USS Shreveport (LPD-12). deployment and the cooperation developed with the Canadian Forces further strengthened our mutual defense efforts. squadron returned to Norfolk after an unprecedented 193 days continuous at sea. objectives were completed one week ahead of schedule allowing Naval Forces to breakout and complete the exercise. While in Canada, the squadron was deployed to NAS Key West in late November for special mine countermeasures equipment training in preparation for a 1981 deployment to the Persian Gulf. force aboard USS Coronado (AGF-11). AMCM equipment and capabilities were demonstrated to representatives of the Japanese Maritime Self-Defense Force. capability and effectiveness of the two forces. Mine Countermeasures FIFTEEN was to become the second commissioned squadron in the Airborne Mine Countermeasures community. BRAVO ZULU to all of the Seahawks of Helicopter Mine Countermeasures Squadron SIXTEEN. Here is another shot from the air of Diego Garcia. 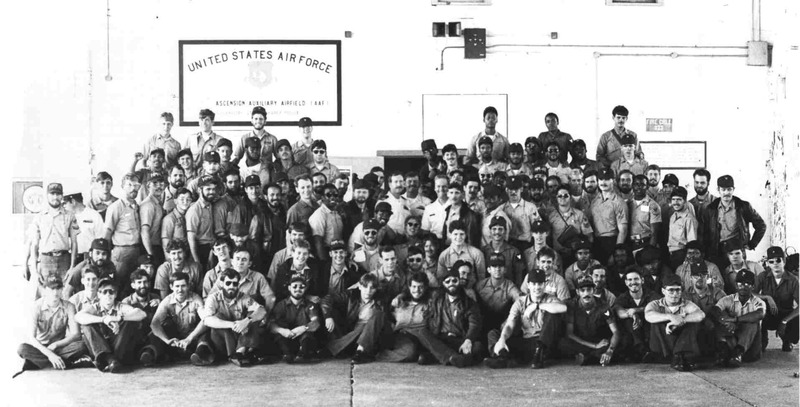 All of this operation was secret, so secret, that when this helicopter squadron arrived, someone saw them come in, recognized someone and went to say hello while they were in the hanger they were secluded in, and was siezed. When the squadron shippedout to the aircraft carrier Kitty Hawk, he went with them, and then also on to the Nimitz for the rest of the mission! He was not part of it, but he had to be secluded for reasons of secrecy. This is the USS Nimitz, the final stop before the mission. It is one of our largest cariers and most powerful. It is from this ship that the helicopters took off from. I landed on the Nimitz once. Do you remember how long the Nimitz was deployed at sea without liberty? It was well over 100 days! That's a long time! Well, the reason I was there that day, was to deliver . . . BEER. . . to the USS Nimitz. It seems the Navy wanted to give their sailors a break, knowing that the ships would be deployed a very long time at sea, so they had our ship, the USS Okinawa load on beer while in Subic Bay in the Philippenes. We were told it was for us for a ship's party, but I now believe it was planned all along. All men on the Nimitz got 2 beers each, and I was one of the men who delivered it. There was a Sailor along with us on this trip, and his job was a Copier repairman. He has written me several times, but each time I tried to contact him, XXXXX@NSASPOOK.COM was his address, my e-mail told me his e-mail address was not valid! If that Sailor wants to try to contact me, he needs to use a friends e-mail, I would love to chat and say hello! An interesting sidenote to that day on the Nimitz, when we delivered the beer,it had been sitting on our flight deck for hours, and it is HOT in the Arabian Sea! So, naturally, the beer was hot. I was draggin the pallet off the ramp of the CH-53 I was on, and the pallet got stuck on something, and slid sideways, and the beer on the side of the pallet got snagged on something on the back ramp and several beer cans got torn. Well, the beer came spurting out, and at high velocity, too. Quite foamy. Being a red-blooded Marine back then, I grabbed the can and tried to salvage the remaining beer in the can the only way I knew how: I drank it. Or, at least tried to. It was so hot, that it tasted awful and I spit it right out again without swallowing any. And that stale beer smell didn't go away for a while from my clothes, either. The same day I visited the Nimitz, I was on the Coral Sea. While this is not my own photo, this is the USS Coral Sea, CVA 43. We delivered mail from the Nimitz, and took some home for us from this ship. If I remember correctly, this was the final destination of that Copier repairman from our ship. This next page is dedicated to the country of Canada! What they did was a great thing! Click on the flag to proceed to the next page. I was invited on board of your ship for dinner in the oficers mess and had a fantastic time. I received a lovely present from one of the officers, a Zippo lighter with the sea hawk HM 16 logo ingraved. I was just wondering how all the crew members are doing, saddly enough I do not remember the names, but I do remember that me and my boyfriend at the time, invited these two officers back at our flat for a nice evening and dinner. I wrote back to her, explaining that I was not HM-16 and asked her if she wanted me to post her message to you all, and she said yes!